Looking at successful people and companies, it's sometimes easy to get discouraged. It's easy to think that some people are just lucky and that we could never achieve what they have. What we don't see is the hard work and failure that most of these people and companies have endured. Kentucky Fried Chicken and Colonel Sanders are synonymous for their fried chicken recipe, but it wasn't until the Colonel was 62 that he was able to sell the recipe that made him a success. In fact, it was the 1,010th prospective buyer that actually bought it. Had Sanders given up after even a thousand no's, he would have never achieved success. Similar stories are the ones of the game company Rovio who made the highly successful game Angry Birds. It was their 52nd game and they were on the verge of bankruptcy when they had their break. Or Walt Disney who was fired from a Missouri newspaper for not being creative enough and went bankrupt within two years of founding his first animation studio. Or even Steve Jobs and Apple who both experienced failure before making the biggest come back in history. But it was Jobs who said years later: "I didn't see it then, but it turned out that getting fired from Apple was the best thing that could have ever happened to me." You know, it's easy to look at other Christians or giants of faith in the past or present and see only their successes as well. We think about how strong their connection with God is and that they are so blessed to have such perfect lives. But what we don't see is the pain, the struggle, the failures, the doubt that these people deal with. And then there are plenty of people who just pretend that everything's alright. Maybe they know that they can't achieve any of this on their own so they fake it, hoping no one will notice. Jesus told the story of such a person. It was a religious leader who acted as if everything was good and was proud of his religion. But there was another character in the story - a known sinner who had reached rock bottom. Someone who knew he couldn't do it but embraced failure as an opportunity to allow God to do something different in him. Jesus ended the story by saying, "I tell you, this man went down to his house justified rather than the other; for everyone who exalts himself will be humbled, and he who humbles himself will be exalted" (Luke 18:14). Everyone fails. Everyone makes mistakes. Don't try to hide it and pretend everything's alright. Admit your failure, humble yourself, and see the failure as an opportunity for God to transform you. Are You a Body Double? I was scrolling through my Instagram feed the other day when I stumbled upon a video of the actress Reese Witherspoon introducing her long-time body double, Marilee Lessley. A body double is someone who stands in for an actor when the actor is not specifically needed, such as shots from behind or over the shoulder with someone else talking. They also stand in when an actor is playing two separate people and they both need to appear in the same scene. Basically it means that Marilee has appeared in many of the films Reese Witherspoon has yet you would have never known it had you not read the credits very carefully. Her life and career is caught up in being invisible, living someone else's life. Thankfully, Marilee's life doesn't simply revolve around being a body double. She's an entrepreneur and someone who has a life of her own, but I began to wonder how many of us are actually living our lives as body doubles. Everyone around us seems to be telling us what life we need to live. Commercials show us what we can't live without, social media is filled with our friends' and influencers' highlight reel, and even our own minds tell us we need to talk and act a certain way to fit in. But is the life that we live really the one that God is calling us to live? The Psalmist says, speaking to God, "You saw me before I was born. Every day of my life was recorded in your book. Every moment was laid out before a single day had passed" (Psalm 139:16, NLT). God has a plan for your life. Are you following it? Or are you to busy being somebody else's body double? One of the things I love about traveling is the ability it gives to step into someone else's culture and get a snapshot of how other people live. There's a quote attributed to St. Augustine which goes like this: “The world is a book, and those who don't travel only read one page.” This summer when Chelsea and I were in Europe, the thing that struck me most was the pace of life over there. Each country is different and obviously differences arise within countries, but overall the pace of Switzerland and Italy was far slower than it is in the United States. Even Rome, which I thought would be hectic and rushed, was laid back and relaxed. I realize that Lawrenceburg has a slow pace when compared to the rest of the US but even our quiet town seems to be balancing on a treadmill compared to the places we visited. Of course, expecting to spend a minimum of two hours whenever we went to eat was something that at first was frustrating, but by the time we left, I was getting used to spending a little more time and actually enjoying life. As I think about the pace of life we are accustomed to in the United States, I can't help but think about how different it is from God's ideal. I don't believe He ever intended us to run around, cramming our schedules and destroying every bit of margin we may have. In the book of Genesis we read that God came down and spent the evenings with Adam and Eve in the Garden of Eden. Genesis 3 tells us what happened that first night after they had eaten the forbidden fruit. "And they heard the sound of the Lord God walking in the garden in the cool of the day, and Adam and his wife hid themselves from the presence of the Lord God among the trees of the garden" (Genesis 3:8). After they had sinned, they didn't want to spend time with their Creator anymore. But before that, they looked forward to this time of fellowship and relaxation. Walking with their maker in the cool of the day was the highlight of their lives. Even though we can't physically walk and talk with God anymore, He still longs to spend time with us. Only when we slow down, however, can we hear the voice of God calling for us. Won't you create the space needed to spend time with Him today? One of my all time favorite songs is a song made popular by Steve Green in the mid eighties: People Need the Lord. The verse begins so melancholy, yet so real. "Every day they pass me by // I can see it in their eyes // Empty people filled with care // Headed who knows where // On they go through private pain // Living fear to fear // Laughter hides their silent cries // Only Jesus hears." Isn't that what we see, day in and day out? Isn't that what people all around us are experiencing? Maybe you're experiencing this yourself. The pain is so relatable, so real, yet we mask it by laughter so no one will know. But the chorus gives the ultimate remedy. "People need the Lord // People need the Lord // At the end of broken dreams // He’s the open door // People need the Lord // People need the Lord // When will we realize // People need the Lord." I don't know what you're going through. I don't know what you're broken dreams are. But Jesus is the open door at the end of those dreams! He is promising you just as He promised the Apostle Paul so many years ago, “My grace is sufficient for you, for My strength is made perfect in weakness" (2 Corinthians 12:9). When you look at the world around you, when you look at yourself in the mirror, and all you see is empty eyes and broken dreams, remember that His grace is sufficient. You may not feel useful, you may not feel worthy, but you don't have to be because Jesus is. And with His strength inside of you, He will accomplish extraordinary things! Yes, all people, including you and me, need the Lord. A small animal suddenly darted in front of the Jeep Patriot, causing Angela to swerve. Next thing she knew, cold, salty water was rising above her knees and her head was throbbing. Touching it, she discovered her head was bleeding profusely. Behind her stood the 250-foot Big Sur cliff that her vehicle had just come careening off of, landing upright on the rocky shore of the Pacific Ocean. But now, her Jeep was filling up with water fast. Finding an emergency tool, she broke the glass and swam to the safety of the cliff. Climbing to a safe ledge, she curled up and slept until daylight. When she awoke, it didn't take long for her to realize that she was alone. The closest she could get to civilization was a high spot on the shore that allowed her to see the cars speeding by along Highway 1, but none of them ever saw her. It wasn't until a week later that a couple of surfers-turned-fishers due to the lack of good waves happened to climb down to the beach, walk an hour north, and come across Angela's vehicle and finally Angela. Help soon arrived and she is currently recovering in a hospital, sharing her miraculous story with friends, family, and the rest of the world. She posted to Facebook that she "can't imagine that there isn't a bigger purpose for (her) in this life." I don't know if you've had an experience where you know you should have died but you're still alive. I know I've had a few of those. As I was reading the news yesterday and discovered Angela's story, it reminded me just how fragile life is but just how amazing our God is. He takes care of us and loves us despite our sometimes foolish mistakes. When Jesus was on earth He said, "What is the price of two sparrows—one copper coin? But not a single sparrow can fall to the ground without your Father knowing it" (Matthew 10:29, NLT). God cares about the smallest creature He has created and He certainly cares about you. I believe that God has a big purpose for each one of our lives. Won't you ask Him His purpose for you is? Yesterday the entire world breathed a sigh of relief and sent prayers of Thanksgiving heavenward. The twelve members of the Wild Boars Soccer Team and their coach have all been successfully rescued from the Thai cave where they have been trapped for the last three weeks. Due to falling oxygen levels, high water levels, and forecasts of rain, the rescue operation became an urgent race against time. The passage was long and narrow, flooded with water. Some of the kids on the soccer team couldn't even swim, so an hours-long scuba journey seemed nearly impossible. In fact, one of the Thai Navy SEALS died last week when he got caught by a flash flood after delivering oxygen to the team. But through what some have called a miracle, the entire team has been rescued and is safe. As I thought about this rescue and how the world has rallied to make it possible, I thought of another rescue that each one of us is involved in. When He was on earth, Jesus made this statement: "The Son of Man has come to seek and to save that which was lost" (Luke 19:20). Just like that soccer team, we are lost and in danger of suffocating. There seems to be an impassable channel between us and the fresh air and sunlight of God's presence. But don't panic! You may not know how to swim, but that doesn't matter. Jesus is on the biggest rescue mission the universe has ever seen. And He will successfully rescue all those who are willing to be rescued. Won't you grab hold of hope and follow Jesus out of this suffocating entrapment and into the glory of His presence? On July 4, 1776, the continental congress adopted the Declaration of Independence, stating that the United States was a free and independent nation. Two days earlier the congress voted in favor of independence and John Adams wrote to his wife, Abigail, that July 2 “will be celebrated by succeeding Generations as the great anniversary Festival” and that the celebration should include “Pomp and Parade…Games, Sports, Guns, Bells, Bonfires and Illuminations from one End of this Continent to the other.” Of course, after congress adopted the Declaration of Independence on July 4, America has celebrated that day ever since. John Adams, however, always thought that July 2 should have been the correct day to celebrate and he turned down invitations to speak at 4th of July celebrations. Though Independence Day became a state holiday in many of the states, it wasn't until 1870 that the US Congress made the day a federal holiday. Today, we celebrate with fireworks, barbecues, patriotic music, and get-togethers with family and friends. Freedom and independence are important. As Americans they run through our blood. As Christians, too, freedom and independence are important. Some of the first immigrants to the United States were people looking for religious freedom, a place where they could practice their beliefs according to their own conscience. But true independence is more than just physical freedom. It involves spiritual freedom: freedom from sin, freedom from guilt, freedom from eternal death. This freedom can only be granted us from one individual: Jesus Christ. In the dialogue that followed the encounter of Jesus with the woman caught in adultery, Jesus said, "Therefore if the Son makes you free, you shall be free indeed" (John 8:36). The freedom He offers is so much more than temporary, earthly freedom. It is an eternal freedom that transcends any other kind of freedom. So yes, let's celebrate Independence Day and thank God for the freedom we have in this country, but let's also thank Him for setting us free through the gift of His Son. I had an interesting discussion with a fellow pastor a few days ago as we stood inside the Colosseum in Rome. We were talking about the gladiators who had fought there and the conversation shifted to the type of entertainment the Romans were used to and how similar or dissimilar to our entertainment it was. I made the comment that I couldn't imagine sitting there watching people kill each other. It seems so brutal to me and makes me queazy just thinking about it. My fellow pastor reminded me that we still do it all the time today as we sit in our living rooms watching the TV. For some reason, that seems different to me. I know scientifically that our brain doesn't know the difference between reality and television, but the knowledge that I'm seeing actors on the screen rather than people actually killing each other somehow changes the way I think of things. But am I right? Is there really any difference between our entertainment and the entertainment of the ancient Romans? Wherever you stand on this debate, the similarities between our modern culture and the ancient Roman culture are undeniable. We are focused on entertainment and serving our own interests. We are surrounded by every convenience imaginable and yet we are unhappy. When John copied the message that Jesus gave to the church in Laodicea, I'm sure he couldn't help but see the similarities between that church and nearly everyone in the society around him. And today, as we look around the world, we see the words ring true - not just spiritually in the church but in every facet of society. "You say, ‘I am rich, have become wealthy, and have need of nothing’—and do not know that you are wretched, miserable, poor, blind, and naked" (Revelation 3:17). Just like the ancient Romans, we are so concerned about ourselves and our own comfort that we don't see we really lack everything that's truly valuable. The entertainment that Christ prescribes is not a gladiator match in the Colosseum. Instead, He says, "Behold, I stand at the door and knock. If anyone hears My voice and opens the door, I will come in to him and dine with him, and he with Me" (Revelation 3:20). Why don't you spend less time pursuing the pleasures of the world and more time inviting Jesus in for supper? You just may find that the entertainment He provides is better than anything this world can offer. Yesterday was incredible. We finally visited one of the most famous Waldensian valleys - the Piedmont Valley and Torre Pellice. It was so inspiring to stand inside the College of the Barbs (Uncles), where pastors and missionaries, known as uncles, would be trained. I was so excited to see the stone table, where copies of the Bible were made. And I stood in awe inside one of the caves where they would worship in secret. I could almost hear the rocks reverberate the sound of their voices as we lifted ours to join in their song - “Faith of our fathers, living faith...” What made the biggest impression on me, though, was a stone monument erected in 1932, at the spot where leaders of the reformation met with the Waldenses for six days and they signed a document which stated that the Waldenses would join with the reformers. This was honestly both good and bad. You’ve probably heard that this was when the Waldenses began keeping Sunday, compromising truth in order to join this new movement. This is true. But there’s something else you need to know. You see, many of the Waldenses had already begun to compromise, allowing priests to baptize their babies and attending mass on Sundays. This union with the Protestant reformation actually brought a revival into the hearts and lives of the Waldenses. As part of this unification, they also delivered the first translation of the entire Bible, a French translation, into the hands of the reformers. As a result, we have much to thank the Waldenses for. As I stand in the alps, gazing out over the beautiful valleys and up at the rocky peaks, I can’t help but wonder what it must have been like to have been here nearly 500 years ago, when the Waldenses realized their darkest days were behind them and that they could join a bigger movement. What would it have been like 700 years ago, fighting a seemingly endless war and taking refuge among the rugged beauties of nature? As I think about these things, my mind goes to the beautiful book of Psalms, many of which were written by a man who himself had to flee into the mountains. “I will lift up my eyes to the hills— From whence comes my help? My help comes from the Lord, Who made heaven and earth. He will not allow your foot to be moved; He who keeps you will not slumber” (Psalm 121:1-3). When the time comes for my faith to be tested, may I be as faithful as the Waldenses who knew that their help came from the Lord. On Sunday, my brother Caleb and I went tubing on Deep Creek in western North Carolina. As many of you know, I have been at Southern Adventist University for the last week and a half taking a class for my graduate degree. Since Deep Creek was only a two hour drive away and Caleb wanted to do something on the water, we figured this would be a fun thing to do. Once we rented our inner tubes, we hiked up this mile-long trail along the creek before attempting to float back down to where we were parked. The man who rented the inner tubes to us kindly told us that about one in every two people end up flipping over into the water. Well, guess who the lucky one was. Except I didn't just flip once. I tipped over repeatedly! It seemed I couldn't make it over any kind of rapid without ending up under the water. On my way back up the trail for our second trip, however, I noticed that everyone seemed so relaxed. How could they be relaxed? I was fighting to keep my inner tube upright and it still didn't work! Then a thought hit me. What if they were staying upright successfully because they were relaxed? I figured I'd give it a try. Instead of focusing on the rapids, I simply relaxed, and focused on getting down the river and enjoying the ride. From then on, I never tipped over my inner tube. Something else dawned on me as I was peacefully floating down the creek. In a movie, the hero will sometimes be fighting against someone who seems to have them matched, strength for strength. There's no way the hero is going to win and he's starting to get tired. Then suddenly, he hears the cry of someone who needs help. Throwing the opponent to the side, the hero rushes to the person's aid as if the opponent never existed and had no more strength than a cardboard cutout. This is the way it was for me on the river. I discovered that, in order to be successful and not get bogged down by things, we need to look at the "rapids" in our lives as distractions, not as problems. If we see them as problems, we focus on them and they become big and powerful. But if we look at them as distractions, then we can brush them aside as we continue towards our goal. The writer of Hebrews had this in mind when he said, "Therefore we also, since we are surrounded by so great a cloud of witnesses, let us lay aside every weight, and the sin which so easily ensnares us, and let us run with endurance the race that is set before us, looking unto Jesus, the author and finisher of our faith, who for the joy that was set before Him endured the cross, despising the shame, and has sat down at the right hand of the throne of God" (Hebrews 12:1, 2). Jesus is our goal. The sins which so easily ensnares us are just distractions. Won't you brush the devil aside and run with endurance the race that is set before you? Managing time is tough. In fact, according to the leading experts in the field, we don't manage time at all. Instead, we manage ourselves in time. And managing ourselves is even more difficult. I'm currently at Southern working on another graduate class. The one I'm taking this year is called, "Time and Life Management for Pastors." It has been just as practical and thought provoking as you would expect. I've discovered that, even though time management is one of my passions and I thought I was at least keeping my head above water, I have a lot to do to manage myself in time better. Life is so crazy and hectic that some would argue that it's impossible to live a controlled life in the world today. But as Christians, it's imperative that we learn to manage our time so we can hear God's voice and ultimately bring honor and glory to His name. Sometimes I wonder if Solomon even understood how crazy life could get when he wrote that there is "time for every purpose under heaven" (Ecclesiastes 3:1). Did he even attempt to do every purpose found under heaven? But if you keep reading, you'll discover a list of all of these things that each have their time and their season. And suddenly you'l realize that Solomon understood time management! One of the first rules is that you have to create a schedule and realize that different things need to be done at different times. You can't attempt everything at once and expect to succeed at anything! But if you look at your day, your week, your year, and set aside different times for different activities, you'll begin to understand that there truly is time for everything. During the eighteenth century, there was a movement in Scottish Presbyterianism that became dissatisfied with the church hierarchy, poverty, and lack of ministers. Their solution was to hold week-long meetings called Communion Seasons where several parishes would gather in the open air and spend time together feasting, listening to sermons, and celebrating the Lord's Supper. In the nineteenth century, immigrants from Scotland brought this tradition to the United States. On the frontier, neighbors were scarce and churches were scarcer. Ministers from different denominations would announce that they would hold a religious meeting at a certain place and all the people around would gather to hear preaching and singing. These became known as Camp Meetings and they were an integral part of the Second Great Revival that swept the United States during the 1800's. Several churches still keep the tradition going, including the Seventh-day Adventist Church. I am on the campus of Highland Academy, just north of Nashville, for the Kentucky-Tennessee Conference Camp Meeting as I type this. I am gathered with all the pastors in our conference as well as many lay people who gather for a whole week to hear preaching and singing and fellowship with one another. Every time I experience something like this, my mind goes to this verse in Isaiah. "'And it shall come to pass That from one New Moon to another, And from one Sabbath to another, All flesh shall come to worship before Me,' says the Lord" (Isaiah 66:23). Camp meetings are a shadow, a small taste of an eternity of fellowship to come. Aren't you so excited for that day? Yesterday was my 28th birthday. I know that doesn't seem very old, but somehow thirty seems like it's just around the corner and I'm well into my downhill slide to fifty. As I was considering my short existence, however, I was thinking about some of the things I've learned. Every birthday gives us another chance to evaluate our lives and take inventory on things we've discovered or maybe things we still need to understand. I ended up making a list of 28 things I've learned and I thought I would share them with you. I know I've learned a lot more than what's on the list, but this is at least a sample of the things God has tried to teach me so far. One of my favorite promises in the Bible was one that God gave to the prophet Jeremiah: “Before I formed you in the womb I knew you; Before you were born I sanctified you" (Jeremiah 1:5). God has a plan for each one of us and He longs to teach us to follow His will. If you haven't recently, sit down and make your own list. What have you learned in your life so far? It probably won't be a comprehensive list, but you'll be amazed at the lessons God has taught you and you'll start looking forward to the other things He's longing to show you. As I was skimming through the news this morning, one headline in particular caught my eye and made me chuckle. It read like this: "Not so sweet: Tanker truck crash spills liquid chocolate onto highway." Apparently a tanker truck in Poland ended up overturning this morning. Thankfully no one was seriously hurt. The driver went to the hospital with a broken arm, but no one else was involved. The thing that made me laugh, however, was that the truck had been carrying liquid chocolate. As it oozed out over the surface of the road, it began to cool, hardening into a huge chocolate candy bar. The clean up crews were having to ship in hot water to try and melt the chocolate so they could clean it up. I know it sounds like the blissful fulfillment of some crazy dream, but apparently a huge chocolate candy bar is just a mess if it's in the wrong place. As Christians, and particularly Seventh-day Adventists, we know a lot of wonderful things. We get excited about how we can discover the character of God through the doctrines that we teach, such as the state of the dead or the Sabbath. These truths can be as sweet as chocolate to you, but before you spill all that sweetness over someone, make sure they're ready for it. Jesus, near the end of His time on earth, said this, “I still have many things to say to you, but you cannot bear them now" (John 16:12). If Jesus still couldn't share things with people who had spent three-and-a-half years soaking up His every word, how much wiser should we be to make sure we don't overwhelm people with all we want to tell them? I'm not saying we shouldn't share these incredible doctrines with people - quite the opposite! The world needs to hear the message we have to give. Just don't overwhelm them; because it turns out that truth, like chocolate, is best one piece at a time. Marcus Aurelius ruled the world from 161 to 180 AD. In spite of an increase in the persecution of Christians during his reign, he was a good emperor. In fact, he is known as the last of the five good emperors of Rome. His death marked the end of the Pax Romana (Roman Peace) and began the decline and eventual fall of the empire. The story is told that Marcus hired an assistant to follow him as he walked through the various towns. This assistant's only role was, when the emperor was praised, to whisper in his ear, "You're just a man." It's said that Marcus had to be convinced to become emperor and he only did it out of duty for his country. Even then, however, he only agreed so long as his adoptive brother also became emperor and they held equal power. He understood the dangers of his position and knew that he had to remain humble in order to lead well. I realize that none of you are emperors or have entire nations in your charge. But whoever you are and whatever responsibility you have, humility is the only way that you can accomplish it well. In the book of Proverbs we read, "Pride leads to disgrace, but with humility comes wisdom" (Proverbs 11:2, NLT). No one appreciates an arrogant person and people refuse to follow a conceited leader. As the redeemed of God, we have no reason to boast. We are only here by grace and mercy! We are saved, not because of anything we have done but because of what He has done! Whatever you have accomplished, whatever greatness you have achieved, remember: You are just a man or woman, here by the grace of God. But you are worth so much because Christ paid so much for you. And that is something worth sharing with the world! This last weekend Chelsea and I were able to attend a pastors / elders retreat at Indian Creek Camp. The emphasis was church planting and revitalization and we came away from the event with renewed dedication and inspiration. One of the things that was discussed multiple times was the need for devotional time in each church member's life. This, of course, starts with the pastor who should be leading the congregation by example. To be honest, I sometimes struggle with having a personal devotion time. That's not to say that I don't spend time in the Bible every day, but the majority of that time is spent for work purposes. It's easy to justify it, however, and say that my study for a sermon or newsletter or worship talk qualifies as my time with God. But, while it does help my walk with God, those things are studied with a purpose of sharing something with others, not specifically to hear what God is trying to say to me. I have made a new commitment to try and spend time with God each day completely focusing on my relationship with Him in addition to spending time for the purpose of sharing that relationship with others. I know I'm not alone in my struggle to prioritize daily personal time with God. But this is something that we each need to make a priority. Several weeks ago in Pulaski, we were studying Daniel chapter six: the story of the lions' den. One thing that stood out to me was Daniel's faithfulness to his God no matter the circumstances. You know the story. The other governors and princes of Medo-Persia were jealous of Daniel, so they tricked the king into making a law forbidding worship of anyone but himself. "Now when Daniel knew that the writing was signed, he went home. And in his upper room, with his windows open toward Jerusalem, he knelt down on his knees three times that day, and prayed and gave thanks before his God, as was his custom since early days" (Daniel 6:10). Daniel's personal time with God was so important that even being threatened with death couldn't stop him. Do you have that kind of commitment to spending time with Him each and every day? On July 15, 1942, a squadron of warbirds was flying from Greenland to England on its journey from the United States. Running into bad weather, the six P-38 fighters and two B-17 bombers turned around and tried to get back to Greenland. Finding the airfield closed, they prepared for a crash landing on the ice cap. Brad McManus was lowest on fuel, so his P-38 was the first to attempt the landing. With the wheels down, however, the nose gear collapsed and the aircraft flipped upside down. The rest of the warbirds put their gears up again and landed on their bellies. Nine days later they were rescued by a dogsled team that led them to the coast and a waiting Coast Guard cutter. The squadron was soon forgotten amongst the other stories coming out of the war, but the pilots still remembered their planes. Finally, in the 1980's, the Greenland Expedition Society began searching for the lost aircraft. They finally found them two miles away from where they had landed and 262 feet below the surface of the ice. 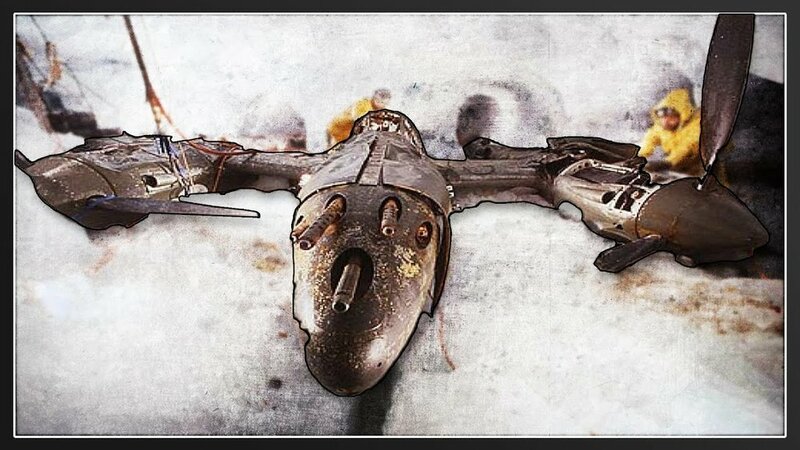 In 1992 they were able to take the last piece of one of the P-38s out of the ice. That aircraft has been fully restored and is now known as Glacier Girl. I was really excited to see Glacier Girl last week at Sun-N-Fun and inspired as I learned about its story. My mind went to our condition as humans. We have crash-landed, are buried by sin and crushed to pieces. But God offers to pull us up out of this crushing prison we have become buried in and puts the pieces back together, restoring us into His image from which we have fallen. David once wrote, "You have allowed me to suffer much hardship, but you will restore me to life again and lift me up from the depths of the earth." (Psalm 71:20, NLT). Just like Glacier Girl, God promises that we will soar, completely restored into His image. What an amazing God we serve! Hundreds of years ago, according to legend, a poor German widow and her children were struggling to survive through a brutal famine. With the country nearly out of food, hunger was always present in their home. But there was also love and the devoted mother was always looking for ways to brighten her children's days. Suddenly she stumbled upon an idea. She had a few small eggs that she had planned for a special treat, but instead of just boiling them and letting the children eat them, she decided to decorate them and hide them in the garden for the youngsters to find. This she did, but as soon as the children found the eggs, they looked up and saw a large hare (hase) hopping away. They assumed that the rabbit had left the eggs for them and ever since then, the Osterhase (Easter Hare) became a part of German folklore. When German immigrants settled in Pennsylvania during the 1700's they brought their legend of a large rabbit that laid eggs on Easter with them. I realize that as we search the history books, we discover that eggs and rabbits have long been associated with the spring equinox as symbols of fertility and new life. Somewhere as early as the 13th century, eggs at least began to be used in Christian circles to represent the resurrection. Whether you compare rabbits and eggs to the resurrection or not, there are plenty of other symbols around us that we see, reminding us that death is temporary. The leaves budding from the trees, the flowers pushing up from the soil, the grass turning green again, even the pollen filling the air lets us know that we have a hope beyond the grave. And this hope was given because two thousand years ago Jesus stood outside of an empty tomb, proclaiming as He had only weeks before at the tomb of Lazarus, “I am the resurrection and the life. He who believes in Me, though he may die, he shall live" (John 11:25). Today, when we look at a cross, we don't see the pagan symbol of death that it once was. Instead, we see a symbol of hope and eternal life. Someday soon the dead will rise. Someday soon we will be clothed with immortality. Someday soon we will see our loved ones again. They will rise because He is risen!